Tour buses can be a great way to travel. Longer distance buses are often an affordable option that can save riders the stress of driving and the cost of gas, not to mention the environmental (and traffic!) benefits of taking cars off the road. In-town tour buses are also a great option, allowing visitors to get an overview of a city and a sense of the places they might want to visit later. Sadly, we have seen far too many tour bus accidents in recent years. Our Northern California tour bus accident law firm is committed to helping victims obtain compensation and holding companies accountable in the hopes of preventing future tragedies. CBS SF reports that a tour bus crash in the San Joaquin Valley claimed five lives on Tuesday. The crash occurred around 3:20 A.M. on Highway 99 North near Livingston, approximately 15 miles northwest of Merced. California Highway Patrol representatives told CBS that the tour bus collided with a pole which tore through the center of the vehicle. The bus was travelling to Sacramento from Southern California. Authorities believe at least 30 people were on board at the time of the accident. The driver of the bus reportedly suffered major injuries. As of the time of this writing, it is unclear how many passengers were injured but CHP reports at least five individuals were airlifted to area hospitals. The cause of the accident has not yet been determined. Tour bus accidents have been far too common in recent years. It was just over a week ago that, according to the team’s website, a Dallas Cowboys tour bus collided with a van in Arizona killing four. In our region, a pedestrian was struck and killed by a tour bus back in January (SFGate.com) and the San Francisco Police Department has cited driver error as the cause of a Union Square crash late last year in which a tour bus slammed into a construction site hitting 14 cars and injuring 19 people (CBS SF). Tour buses, like city buses, are considered common carriers under California law. Civil Code Section 2100 provides: “A carrier of persons for reward must use the utmost care and diligence for their safe carriage, must provide everything necessary for that purpose, and must exercise to that end a reasonable degree of skill.” In brief, this means that buses, taxis, and similar vehicles they are held to higher standards than a typical driver. There are a number of different parties that may be liable to those injured in a tour bus crash. Potential defendants in a civil injury suit include (but are not limited to): The tour bus driver; The tour bus company; A company that performed vehicle maintenance services for the tour bus: The manufacturer of the bus and/or the manufacturer of component parts for the bus, or; Another driver involved in the crash. Determining liability in a tour bus accident, like any crash, requires a fact-specific inquiry. While the police may conduct an investigation, injured individuals should also obtain experienced legal counsel to conduct their own investigation into the events surrounding the crash. As an experienced San Francisco bus accident lawyer, Attorney Brod works with top-notch experts to uncover the cause(s) of tour bus accidents and to recover compensation for the victims. If you were injured or lost someone you love in a tour bus accident in Northern California, call our office at (800) 427-7020 to learn how we can help you. 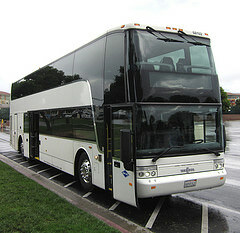 In addition to our San Francisco location, we have offices for our tour bus accident law firm in Santa Rosa and Oakland. We can also meet you at another location if necessary. The Brod Law Firm serves all of Northern California and also much of Central California. Call to learn more.